Justin Bieber appears to be getting serious about relaxation as he enjoyed a self-care day on Wednesday. The pop icon, who recently enjoyed a mini break in Laguna Beach with wife Hailey Baldwin, was seen carrying a pillow as he left a building in Los Angeles on Wednesday. 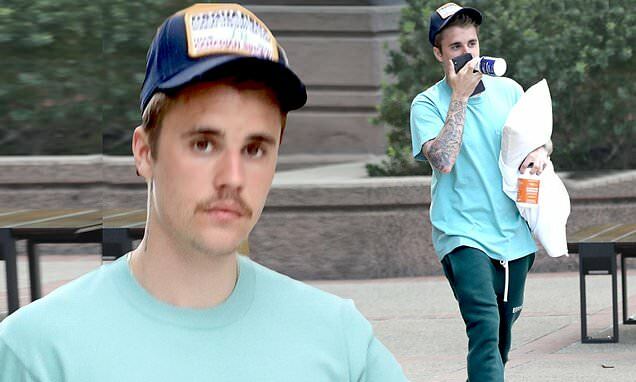 The 25-year-old singer wore a trucker cap and an aqua blue T-shirt with green pants as he was seen out solo and also headed to a yoga store to make some purchases. The singer has been open about his recent struggles with depression and anxiety and gave an update to fans on his situation earlier this month. 'Been struggling a lot. Just feeling super disconnected and weird.. I always bounce back so I’m not worried just wanted to reach out and ask for your guys to pray for me.' Part of his message, on Instagram, read. Hailey has been a constant support for the Sorry hitmaker and apparently pushed the star to go to therapy when his sleep patterns began to change recently. 'He's been sleeping far more than usual, and struggles to get out of bed until very late into the morning or early afternoon,' a source told People. In their joint Vogue interview Justin was very candid as he spoke about the balancing effect Hailey has on him.